The Hubble Telescope's tour of duty is coming to an end, but it's still good for some incredible finds. 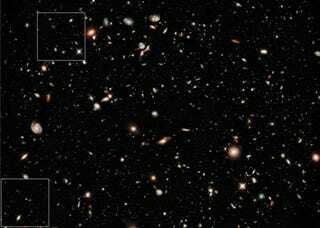 And it's hard to top these images of ancient galaxies that date to a mere billion years after the Big Bang. The images here were taken during August 2009 over the course of 4 days and 173,000 total seconds of exposure times. Hubble used the newly installed Wide Field Camera 3, which allows it to see near-infrared wavelengths in the electromagnetic spectrum. This allowed the telescope to observe light from the very beginnings of the universe.This is because the expansion of the universe distorts the ultraviolet and visible light from these galaxies over the course of their unimaginably long journey, pushing them into near-infrared wavelengths. The square insets in the image up top can be seen more closely here. The circled regions represent galaxies that are estimated to be between 12.9 to 13.1 billion years old. The universe itself is estimated to be about 13.5 to 14 billion years old, meaning these galaxies could date to a time as little as 400 million years after the Big Bang. Either way, these galaxies are the oldest ever observed.